Ben Nevis, Britain's highest mountain, forms a horse-shoe shape ridge with Carn Mor Dearg, the massive Nevis dwarfing the latter (9th highest). The two mountains are connected by a narrow ridge with a rocky crest, the Carn Mor Dearg (CMD) arete.The easiest ascent of "The Ben" is from Glen Nevis, via Meall an t-Suidhe to the W following the old road which was constructed to service the hotel and observatory, now both ruins near the summit. This route reveals little of the magnificence of Nevis, and there is an alternative route for hill-walkers who can cope with scrambling, via Carn Mor Dearg and the CMD arete. An ascent is also possible via the head wall of Coire Leis to join the southern end of the CMD arete. Both these routes approach the summit of Ben Nevis from the E. The N face of the Ben should be left to mountaineers with rock climbing experience. 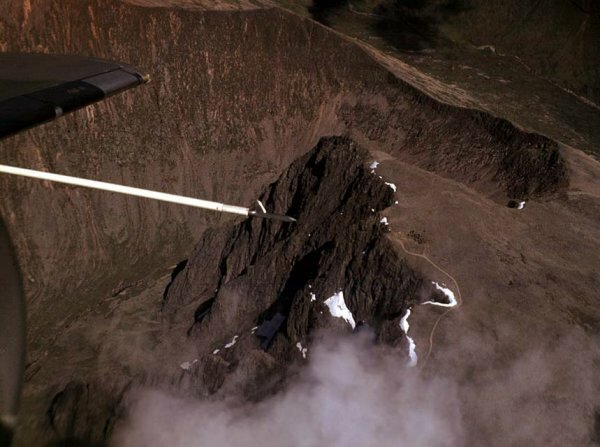 Ben Nevis from the air, just look how close the path goes to a cliff face, be prepared. Tower Ridge from the summit of Ben Nevis - June 2005. 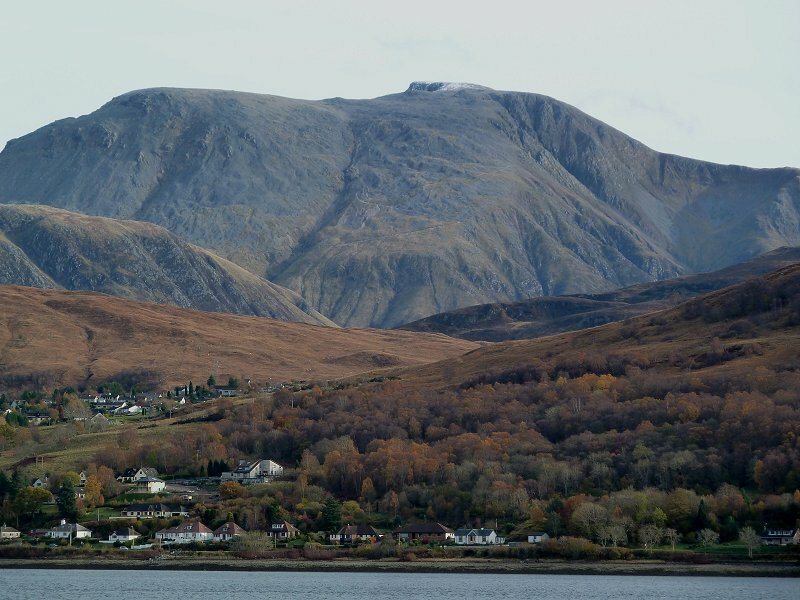 Ben Nevis seen across Loch Linnhe from the WSW, with the houses of Auchintore. The zigzags of the Tourist Route are clearly visible from this angle. 7th November 2010. 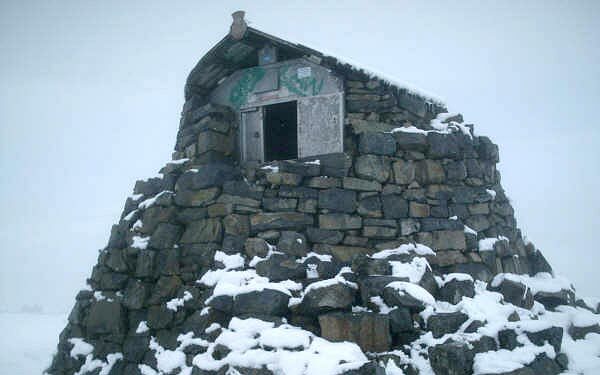 The summary information of one or more ascent routes that include Ben Nevis. 1 1370 m 14.83 km 5.5 hrs Ben Nevis This is the "Tourist Route" which thousands climb each year, it is fairly strenuous. It can, however, be a serious ascent as the "path" disappears on the higher boulder slopes and navigational errors can and do lead to disaster. 2 1778 m 16.68 km 6.5 hrs Ben Nevis and Carn Mor Dearg This is a more difficult ascent with some exposure and scrambling, but it avoids most of the crowds and gives a taste of real mountaineering. Navigate with care, this is a dangerous mountain for the unwary. 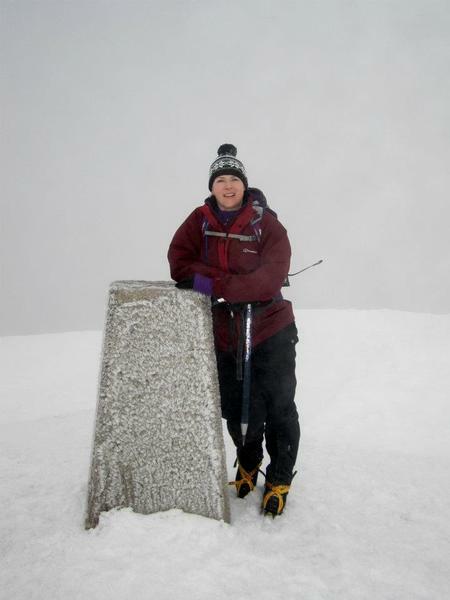 Myself at the summit of Ben Nevis, the final summit in my National 3 Peak Challenge which I undertook over 6 & 7 June 2015. Starting on Snowdon at 7.30pm on Saturday 6 June, on to Scafell Pike then Ben Nevis completing the challenge in 19hr 45min. 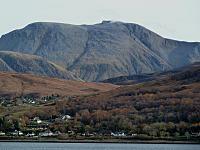 Post a few words about Ben Nevis or read what others have had to say. Showing the most recent 5 of 35 comments. Would you like to view all 35? Attempted this again on Feb 10th this year. 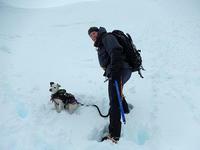 Snow conditions were very difficult with snowfall extending down to before the halfway lochan. The mountain path disappeared at Red Burn gully and the snow was unstable on the Western slopes. Got to 725m before we decided to give this up as a bad job. By all accounts, the conditions further up were abysmal with zero visibility and high winds. A group of 8 started our ascent on 12 April 2013, we split at 1000m and 3 returned at this point, the other 5 myself, Billy, Iwona, George and brian pushed on to the summit in favourable conditions, light snow, little wind and approx 0 degrees, The snow as we approached the boulder field was a foot deep and when we reached the summit the clouds above us cleared to reveal blue skies but no views as the cloud base was sitting just below the summit itself. we had the summit to ourselves and only saw 12 other people the entire trip. Mountain path, tedious, maybe but gloriously empty. worth it !!!! 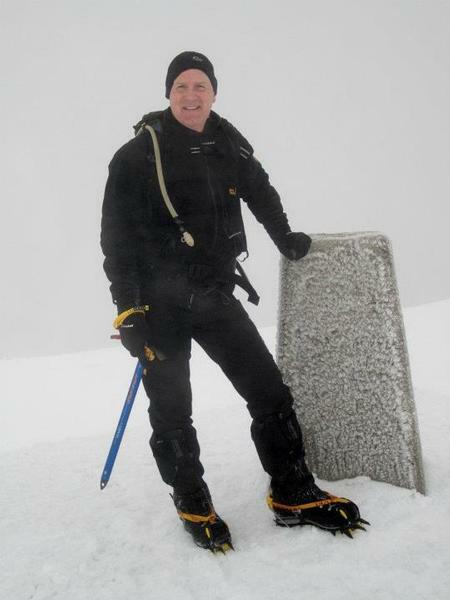 I climbed Ben Nevis via CMD Arete . I started at the tourist route and turned left at the halfway lochan and walked away around the north face and then a very tiring steep climb up to the ridge of the cmd and it wasnt that easy due to the 50 - 60mph winds then up the shoulder climb up to the summit was prettu brutal but i did get some clear views which made it even better. it really is an amazing walk but not for the faint hearted as there is quite a bit of exposure and some scrambling and watch out for gardyloo gully near the summit as its tricky to navigate in cloudy windy conditions. it took me 7 hours all in. I summited Ben Nevis first in Aug 2010, the weather was awful and most of our group turned back but this time on 6th August 2011 we set off to raise funds for Make A Wish and the weather couldn't have been kinder, most of our group made it, 2 turned back just over half way with exhaustion but I have to say that sitting on the summit having lunch looking over all the mountain peaks that day is scenery I won't forget in a while. We watched some brave mountaineers tackle the north face and after the cold set in we moved onto our descent.....which was long to say the least! Beautiful and memorable! Climbed again on 2.08.2010 with my friend Terry (who had only climbed 1 corbett before & wanted a challenge!). Started off on reasonably clear day again with some clouds & only got bad when we reached the top & had a wee shower of rain when at the summit. Cleared again on the way down & had spectacular views again. Love this hill, but forgot how boring and hard going it can get near the top but the wee glass of champagne again at the top (its tradition!) helped. Would definately do it again but hopefully next time not the tourist route.